why? because he’s a child star. 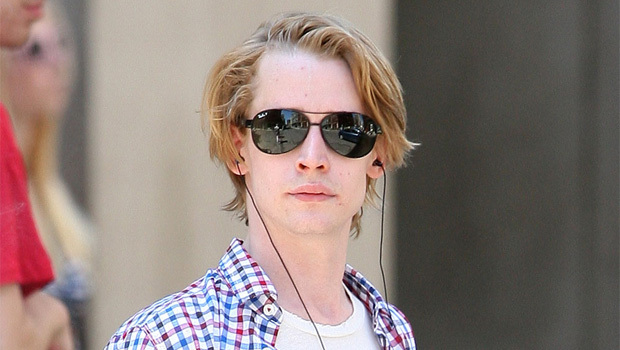 he’s not particularly active in hollywood, seldom does publicity, and yet he’s out there doing stuff. and, while he doesn’t receive loads of coverage, the coverage comes in a tiny though steady trickle, so there’s apparently some market in concern-trolling him on a semi-monthly basis. 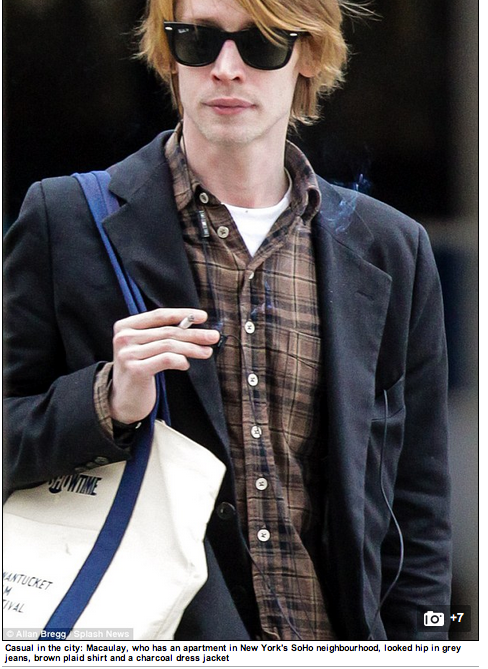 also, four years after their break-up, we are still reminded in nearly every article about mac that appears in the daily mail that mila kunis left him in 2010. that’s interesting, because usually it’s women who are portrayed this way rather than men. be real: four years from now, is george clooney’s name gonna be linked to stacy keibler’s? likely no. 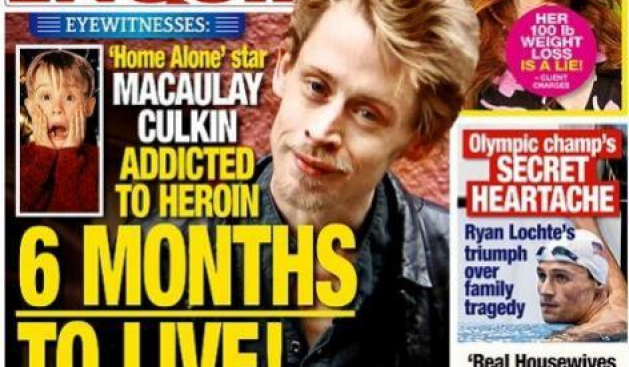 lastly- in what i guess is turning out to be a manifesto for why i’m going to keep writing on the daily mail‘s reports about macaulay culkin- the daily mail‘s use of writing whole articles based on looking at photographs is particularly evident in their coverage of mac and that is maybe one of my favorite things ever to point out. anyway, what’s mac up to these days? this begs for context as the use of the comparatives in the title raises the question: happier and healthier than what? fortunately that is not a great mystery but something we can actually know. because it’s a reference to the 13 january 2013 article when he was “healthy and happy” because he was seen carrying a hudson news bag at laguardia. 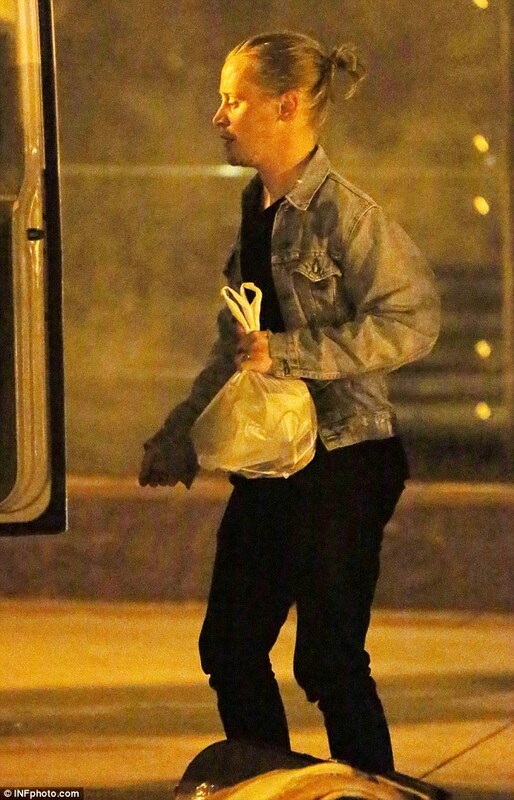 an incident which, as all things do, leads to the time when he wasn’t healthy and happy because, on 22 december 2013, he ATE ALONE AT TACO BELL!!! so mac is healthy and happy because he’s not eating alone. and he took a shower and cleaned up and presented a better image of himself than he did when all those heroin rumors were going around. remember those? yeah, that story’s dead. 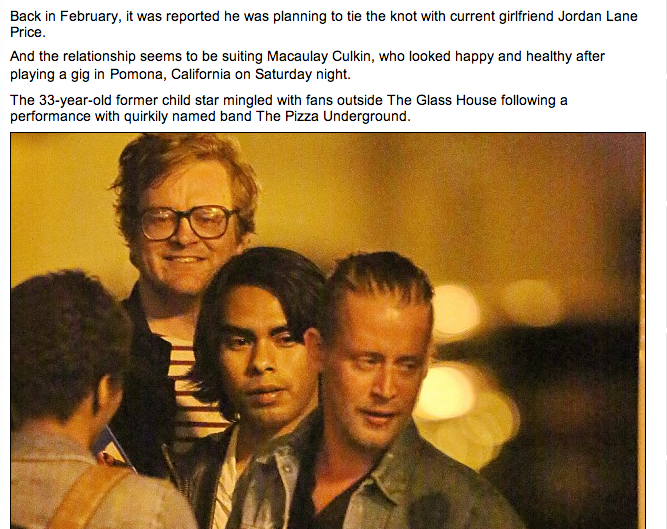 drug problem solved because mac’s got a girl (are we to believe only single people do drugs?? is that why zac efron suddenly has a new girlfriend??) and now, in today’s article (btw, sadly lacking in sources at charles de gaulle airport talking about mac like he were the villain in a penny-dreadful), he’s healthier and happier because he’s still got that girl and is engaged in work. you guys, is that BLONDE COLIN FIRTH behind him??!?!?! other ways he’s just like us? he puts things in a bag and places them in a vehicle. also, note the restraint they showed in not speculating about what might be in the bag. two years ago this, when mac was single, this undoubtedly would have been a Drug Bag of Doom. so remember that mac’s happiness stems from the fact that he’s in a relationship with a woman who looks like mila kunis and, therefore, we can assume, he’s no longer eating alone. 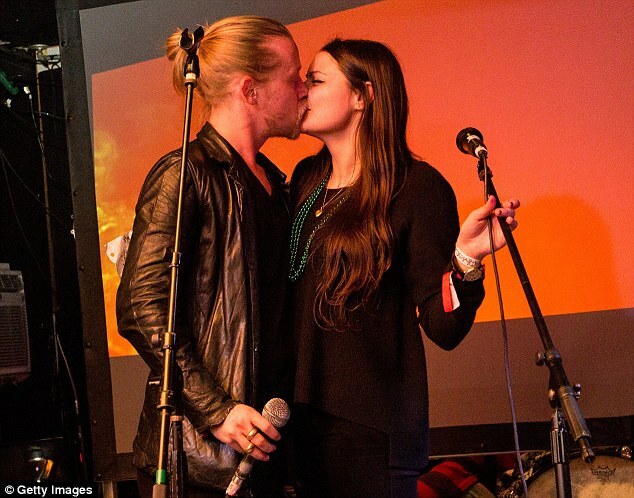 and, now that mila kunis is engaged, mac is racing her to the altar. since the daily mail is the chief proponent of this theory, of course it’s discussed here. lookit!! he’s so loved up. except this is actually a photo from last year and she wasn’t even at the show we’re talking about where he put the bag in the van. presumably most readers overlooked that discontinuity as i didn’t notice it until the third read, and i’mma assume not a lot of people read daily mail articles three times thru. so she, jordan lane price (would that everyone in her family is named after a mad men character and a new kid, and her sisters were jonathan roger sterleng, joey don drayper, donnie burt kooper, and danny ted chaw) wasn’t there. but she’s been there. and that makes mac happy. sigh. for real, is the qualification for being private with your personal life now not having a twitter or instagram account? this is, i think (though i am not 100% certain), a photograph of jordan lane price. if it is, then it’s doing all of the daily mail‘s work in establishing the kunis look-alike assertion. if it isn’t, then it is very confusingly captioned and doing an entirely different thing: suggesting that kunis and culkin were doomed by her use of instagram. Sad thing is he and Jordan were broken up by 5/14 and she had a new bf, so the Daily Fail is extra dumb. You are hilarious, however. 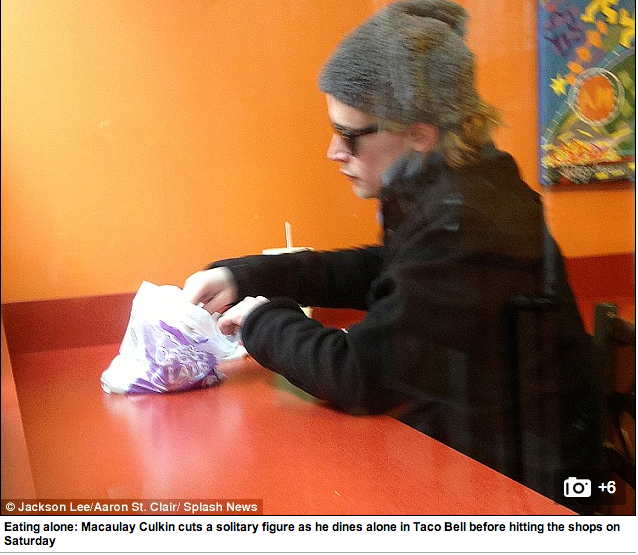 Macaulay probs had Taco Bell in that bag.